They are identical to those of the Timeline (we will talk about them later on). They let you show or hide layers. The white circle indicates that the layer is visible in the project's window. By clicking on it, a grey circle replaces it and hides the layer in the project's window. Here, the Orange and Jaune groups' buttons are unselected : layers being in these groups no longer appear in the Timeline. 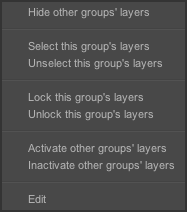 The layer's name and its instances are also greyed. Let's then study the options on the far left (outlined in the screenshot below). They let you reduce the layers in the Timeline. 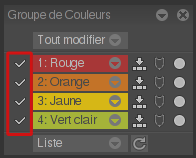 By unchecking the adjacent square, all of the layers that are in the correponding color group will no longer be displayed in the Timeline, even if they are still part of the project and visible in the workspace. Nevertheless, their existence is symbolized with colored lines. 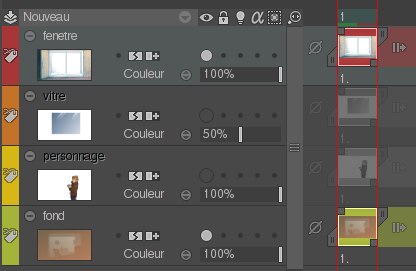 You will have the resulting Timeline below, with lots of empty spaces to create new layers. You can have a more global action with the Edit all submenu, which will let you Show or Hide all groups. Left clicking on the arrow adjacent to Red will open a submenu, proposing you several actions similar to the ones we have described. The same menu will be accessible for each color you will add.